Robert Parker 94 points. Poggio di Sotto and proprietor Piero Palmucci continue to turn out beautiful examples of traditionally made Brunello made in a natural, non-interventionalist style. 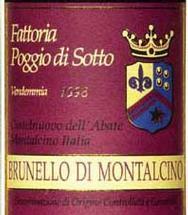 The 2003 Brunello di Montalcino is a subtle wine. Somewhat reticent in its aromatics, it explodes on the palate with a burst of ripe, candied Pinot-like red fruit. Subtle notes of licorice, smoke and tar develop in the glass, but this remains a fruit-driven wine made in an atypically ripe, lush style for this producer. The wine offers lovely balance, well-integrated tannins and most important of all, a sensual, inviting personality that makes it difficult to put the glass down. This is a great effort in a vintage Palmuccie describes as very challenging. When all is said and done, in 2003 the estate bottled only 40% of its potential Brunello production and decided against making its Reserva.